Today (and possibly more days in the future) I am stealing an idea from Jette to post an entry about a random picture from my Flickr stream. Since she’d already tried and failed to find an easy way to select a random shot, I decided to look at my stats for today’s view and pick the one with more than a single view which seemed the most strange for people to be looking at. (I am a programmer, so perhaps if I apply myself I can figure out a better way, but given how many other things I need and want to do, I doubt that will happen). I came up with this chili powder can I’d found in my pantry and posted as part of the photo a day project I did last year. 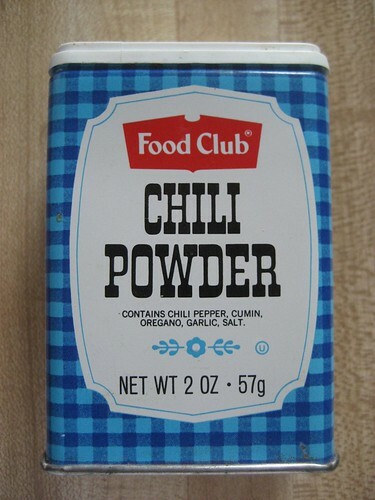 Judging by which store brand it is and the design on the can, I’d conservatively estimate that we’re looking at 20-year-old chili powder here. This demonstrates two things about me: I don’t cook very much, and I’m crap at decluttering. I wish I could make time to do more of both, especially the decluttering, but again, there are a lot of other things I need and want to do. This particular can is gone now, in part because taking its picture highlighted for me how ridiculous an object it was to be holding on to. Perhaps in 2011 I should do another photo a day project where I just snap pictures of my clutter; I have not yet tried that approach to clearing out. On this date in 2009: Star of Light, in which I shared images of my Christmas tree topper. I don’t know that we’re going to set up a tree this year. 2008: Dinner and a Show, in which Mr. Karen and I went out for a night on the town with friends. I wish we did this more. 2007: WDW 5: Not Quite the Final Frontier, in which I was still nattering on about my vacation, and Holiday Spirit, in which I shared a different Christmas tree. 2006: Textile Thursday, in which I opened up my fabric closet. 2005: Trash into Something, in which I showed craft ideas I hope no one would ever again turn into completed projects. 2004: Skiing, Snickers, and Stuff, in which I recapped a ski trip. 2003: Thumbs Up for Snow, in which I recapped a different ski trip. 2002: Zoo Baby Quilt, in which I had a finished project.